Mediterranean wetlands include a wide variety of natural habitats such as river deltas, freshwater, brackish, and salt lakes and marshes, permanent and intermittent rivers, floodable forests along rivers, as well as salt pans and dammed reservoirs. Wetlands cover 18.5 million hectares in the Mediterranean region, between 1.7 and 2.4% of the total area of the 27 Mediterranean countries (and 1 to 2% of wetlands in the world). The deltas are located at the mouths of the main rivers that flow into the Mediterranean Sea. The silts and sands transported toward the sea accumulate, and progressively create dunes, marshes, and new strips of land (sandbars) that enclose lagoons, and form a delta that protrudes into the sea. A natural delta typically features a wide range of wetlands whose salinity generally increases as we get closer to the sea. The lack of tides in the Mediterranean Sea is particularly favourable to the formation of deltas; however, there are few large permanent rivers, sometimes fed by water from outside the region, such as the Rhone, the Po, and the Nile. The sediments carried by a river are normally deposited a few hundred meters off the coast, where the marine currents slow down the rate of flow of the river. These currents then shape the sand deposits often creating offshore bars parallel to the coast, behind which lagoons are formed. The lagoons are generally linked to the sea by a variably permanent inlet, and they can also receive water from rivers. 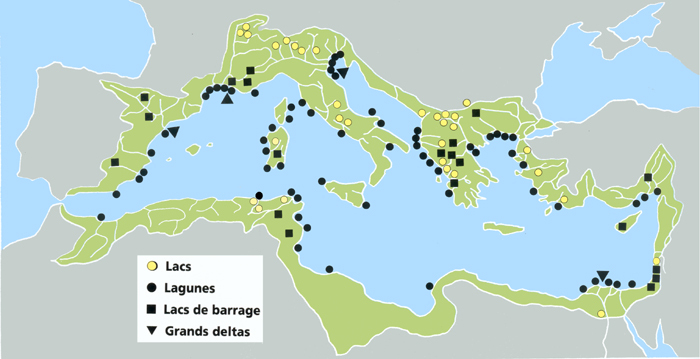 Various mechanisms can eventually cause certain lagoons to become cut off from the sea, which means their water becomes less saline (as is the case of some lagoons in the Languedoc). Others have been artificially separated from the sea to drain them for agricultural purposes (the Drana Lagoon in Greece). The largest zones of lagoons and salt marshes in the Mediterranean region are found in Egypt (the Nile Delta), where nearly a quarter are located, in the south of France, from Venice to Trieste in northern Italy, and on the Tunisian coast. They are often formed inland when a sea lagoon becomes separated from the sea and receives freshwater from rivers (as is the case of the deltas of the Nile, Rhone, and Po). Very few of the thousands of freshwater marshes that used to cover immense areas in the alluvial plains of the Mediterranean Basis still exist today, and their flooding regime is almost always controlled by humans. They encompass various types of shallow habitats, which are often flooded only part of the year, ranging from the reed beds surrounding bodies water to grazed wet meadows, and also temporary ponds, which can be located outside of the alluvial plains. Due to the absence of significant tides in most of the Mediterranean Sea, there are very few mud flats between the limits of the high and low tides except part of the Gulf of Gabes, located in southern Tunisia between the coast and the Kneiss archipelago. In addition, the Atlantic coasts of Portugal and Morocco, which have a Mediterranean climate, feature extensive intertidal mud flats. Salt lakes (chotts and sebkhas in Arabic) are some of the largest wetlands in the Mediterranean Basin. The largest are in North Africa, where the combined effects of sudden torrential rain and rapid runoff in the desert-like landscapes sometimes results in the formation of vast expanses of water in continental depressions. In the chotts, the permanent vegetation is scarce and adapted to the very temporary flooding of these sites. Sebkhas are shallow depressions in which water is present for long periods, and generally only dry out completely at the height of the summer. Those in which plants grow are usually much smaller than the others – they concentrate and retain water better and are less saline. In the Sahara Dessert and much of the Levant, oases are often cultural ecosystems created by local populations, notably for agricultural purposes, fed by shallow or deep groundwater. Azraq in Jordan is one of the most important oases for fauna and flora. It hosts rare reptiles, and is also an important stopover site for migratory bird populations. Salinas or salt pans are very artificial wetlands, yet they are of very great biological value because they host a wide range of species close to those found in coastal lagoons. In low-salinity basins, certain salt-tolerant plant and fish species thrive; whereas, in basins featuring high salinity, only brine shrimp can survive. The regular season cycles of the salt pans, which are flooded in the summer (contrary to their natural cycle) guarantees the availability of abundant food resources, and consequently the presence of specific avifauna. These wetlands play an increasingly determining role in the Mediterranean Basin. The reservoirs, which are situated in the mountains, can replace to some extent the wetlands of the plains below. In some cases, they can also be important zones for hosting migratory birds. Today, this site is on the Ramsar Convention list.